BELIZE CITY, Mon. Apr. 18, 2016–The semifinals of the Premier League of Belize (PLB) 2015-2016 Closing Season came to an end yesterday with games played at the MCC Grounds in Belize City and the Norman Broaster Stadium in San Ignacio. MCC: Pretty football is difficult to materialize on the still dusty, irregular surface of the MCC, despite the deceptive grass cover, which does not stop the rising clouds of black dust whenever the ball is kicked, and still causes bad bounces at critical times when strikers are trying to “shake” defenders. 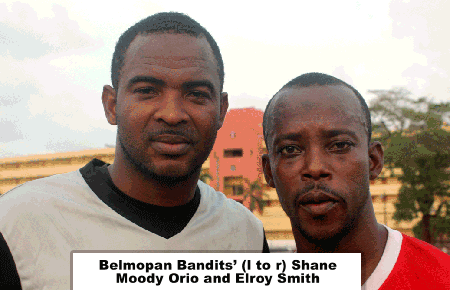 Nevertheless, Belmopan Bandits FC took their 2-1 win from last week into the MCC yesterday against Belize Defence Force FC, who are yet to lose this season on their home turf in the old capital. A draw was enough for the Bandits to gain the aggregate win and advance to the finals, and that is exactly what they came away with. 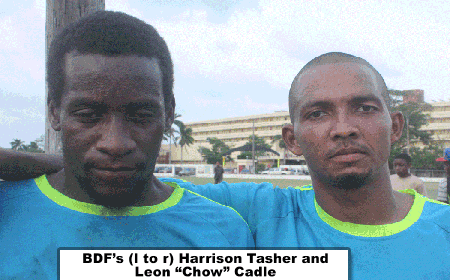 Bandits got on the scorecard first through a penalty conversion in the last minute of first half by, captain, Elroy Smith after BDF goalie Tevin Gamboa had taken down the Bandits’ Jeromy “Jarro” James in the eighteen, in what many fans thought was offside position. But, despite no offside flag being waved, Gamboa’s take-down was ill advised, and gave referee Christopher Reid little choice. Gamboa guessed right, but Smith’s kick was hard enough to still hit the back of the net after a slight deflection. It was a keenly contested and very physical game, with many delays due to injuries. About 30 minutes into second half, Harrison Tasher’s long cross-field pass, from just past midfield on the right side, found an advancing Leon “Chow” Cadle on the far left; and when Chow seemed sure to beat his defensive marker to the ball, Shane Moody Orio, in goal for the Bandits, came out fast to narrow the angle; but an alert Cadle expertly lifted the ball over his head, and it travelled some twenty-five yards, sinking into the open goal; 1-1 tie game. But the game winner wouldn’t come for the BDF; and it was just as well, for the long whistle came at 5:30 p.m., and overtime would have pushed into fading light. With the 1-1 tie, the Bandits are aggregate 3-2 winners of their semifinal series, and have secured a spot in the Finals. Norman Broaster: Without the services of their leading striker, most fans gave Placencia Assassins FC little chance against star-studded Police United FC in their semifinals game 2 at the Norman Broaster Stadium, after Police had taken game 1 by a 3-2 score the previous week in Independence. For what most would consider a minor grounds infraction before the start of the game last Saturday night at the Michael Ashcroft Stadium, Placencia’s Luis “Baaka” Torres had been red-carded, and reports were that the PLB Disciplinary Committee had upheld the suspension from the 2 games of the semifinals. But the Placencia squad came to play on Sunday; and at the end of hostilities at the MCC, reports coming from Cayo, where the game had started a half-hour later than at the MCC, were that Placencia led 3-2 in the waning minutes of regulation. Well, the shocking report came in later; with the aggregate tie (5-5) at the end of regulation, it had gone first to overtime, and then to penalties; and Placencia came out victorious, and are on to the Finals against the Bandits.